February 2018 – Page 3 – Welcome to Wyandotte Daily! Kansas lawmakers return to the Statehouse on Wednesday still facing the largest challenge of this year’s session: balancing the budget and responding to a court order to spend more on schools. In recent years, though, lawmakers plucked the low-hanging fruit when it comes to finding cash. That makes any revenue harvest ahead that much more difficult. To help weather budget crunches in recent years, lawmakers have diverted hundreds of millions of dollars from the state’s highway fund. The current and coming year budgets already rely on about $580 million in diverted highway money to help balance the books. Republican Rep. Steven Johnson, chair of the House Taxation Committee, said they’ve also turned to tax hikes in recent years along with reliance on highway money. Lawmakers have raised the sales tax and last year overturned the state’s 2012 tax cuts by overriding a veto from then-Gov. Sam Brownback. Johnson said lawmakers might be tired of debates about raising taxes. “I don’t see a tax plan that I am excited about that comes together out of that,” Johnson said. Still, Johnson said his committee will discuss property taxes next week. The goal is to gauge how much of an increase lawmakers and the public would be willing to accept. Whatever lawmakers come up with, they’ll have to consider Republican Gov. Jeff Colyer’s position. He hasn’t given them a mandate, but outlined what he wants to see in the plan. “Increased investments in K-12 education must come through a phased-in approach that doesn’t increase the tax burden on Kansas families,” Colyer said during a speech to lawmakers this month. That adds further difficulty to passing a tax increase. Johnson said it would be especially difficult to gather enough votes to override Colyer’s veto. Legislators could also consider budget cuts to other services to boost spending on schools. Across-the-board cuts of 18 percent could be needed to come up with additional funding for Kansas schools. Some lawmakers argued the state should have looked at spending cuts last year instead of raising taxes. That debate could be repeated this year if tax increases are on the table. There’s another area of tax policy lawmakers have discussed in recent years: tax exemptions that give breaks to certain entities. The exemptions from sales tax range from haircuts and other services to Girl Scout cookies. The challenge is that recipients of tax exemptions often fight hard to keep them. House lawmakers passed a bill to repeal $60 million in sales tax exemptions last year, but it died in the Senate. Tax collections consistently beating estimates will help the financial situation, but Johnson said there are other areas lawmakers also hope to boost spending. He said they’d like to invest in state mental health services and repay a missed payment into the state pension plan. Kansas City Kansas Community College wrapped up its pre-conference baseball preparations Monday with the Blue Devils’ biggest offensive outburst in years. Pounding out 22 hits including nine for extra bases, the Blue Devils coasted to a 30-4 win at Maple Woods to set up the start of the Jayhawk Conference season Thursday. KCKCC will play host to Coffeyville in a 1 p.m. doubleheader and then complete the four-game series at Coffeyville Saturday. Eleven of the 15 Blue Devils who saw action had hits at Maple Woods including six who had two or more in improving their non-conference record to 6-4. Freshman second baseman Kevin Santiago led the way, driving in six runs with two home runs (one grand slam) and two singles. Three others had four RBI’s, Tyler Pittman with a home run and two singles; Remington Kelly with a pair of doubles; and Brigham Mooney, who doubled in two runs and drew a walk and was hit by a pitch, each with the bases-loaded. James Bradley Jr. drove in three runs with three straight singles; Gavin Gifford had three singles and two RBI; Josh Schumacher doubled and singled; and Billy Kelley and Julius King each doubled as KCKCC scored in every inning but the sixth. KCKCC took a 4-0 lead in the first on singles by Schumacher, Pittman, Gifford and Adam North and then broke the game wide open with the long ball. Pittman belted a 2-run home run and Santiago followed with a solo round-tripper for a 7-0 lead in the second and the Blue Devils made it 14-0 in the third on a 7-run uprising capped by Santiago’s second home run, a grand slam shot to center. Remington Kelley had the big blow in an 8-run fifth, a bases-loaded triple while Santiago singled twice in the inning and Bradley drove in two with his third straight hit. The Blue Devils closed out the rout with six runs in the seventh. After a single by Brady Holder and a double by Billy Kelley, KCKCC got back-to-back two-out doubles by King, Mooney and Remington Kelly. Hunter Paxton got the pitching win, allowing three hits and two runs in four innings. He stuck out five, walked one. Ethan Baltz struck out four in two innings of two-hit relief and Zach Watson closed out the win, allowing two runs on one hit and three walks. Maple Woods used five pitchers who combined to hit four Blue Devils and give out eight walks. Rain and fog are in today’s weather forecast, with a high of 56 degrees, according to the National Weather Service. There is a 60 percent chance of drizzle before noon, then showers are likely between noon and 3 p.m., followed by showers and possibly a thunderstorm after 3 p.m., the weather service said. A calm wind will become north 5 to 8 mph in the afternoon. 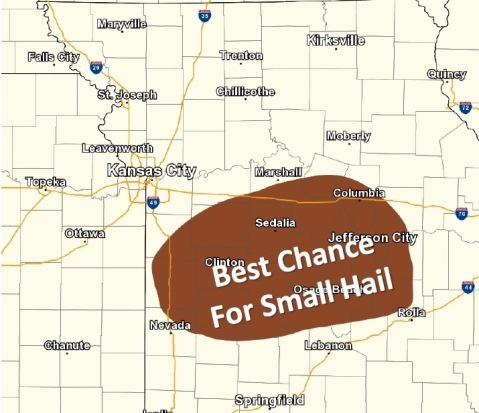 To the south and east of the Kansas City area, thunderstorms with small hail could develop. Tonight, there is a 60 percent chance of showers and possibly a thunderstorm before midnight, then a slight chance of drizzle between midnight and 3 a.m. The low will be around 32 with a north northwest wind of 8 to 14 mph, gusting as high as 28 mph, according to the weather service. Thursday, it will be sunny with a high near 51 and a north northwest wind of 8 to 14 mph, gusting as high as 24 mph, the weather service said. Thursday night, the low will be around 28 with mostly clear skies, according to the weather service. A north wind of 5 to 7 mph will become light and variable in the evening. Friday, expect a high of 55 with sunny skies, the weather service said. There will be a south southeast wind of 5 to 11 mph. Friday night, the low will be around 36 with mostly clear skies, according to the weather service. Saturday, it will be sunny with a high near 60, the weather service said. Saturday night, the low will be around 42 with partly cloudy skies, according to the weather service. Sunday, there is a 30 percent chance of rain before noon, with a high near 58, the weather service said. Sunday night, there is a 70 percent chance of rain, with a low of 44, according to the weather service. Monday, the high will be near 52 with partly sunny skies, the weather service said. Monday night, the low will be around 31 degrees, according to the weather service.